We are big snack people in our house. My son especially loves having mini-meals throughout the day, and none of his meals end up being very big. It’s exhausting to sit him down, let him pick at a little bit of food, then clean it all up and start all over again just a couple hours later. I find that when I combine snack time with playtime, it gives me a little bit more time to get something done while he eats/plays, rather than the typical 10 minutes he spends picking at his meal or snack until he gets bored. 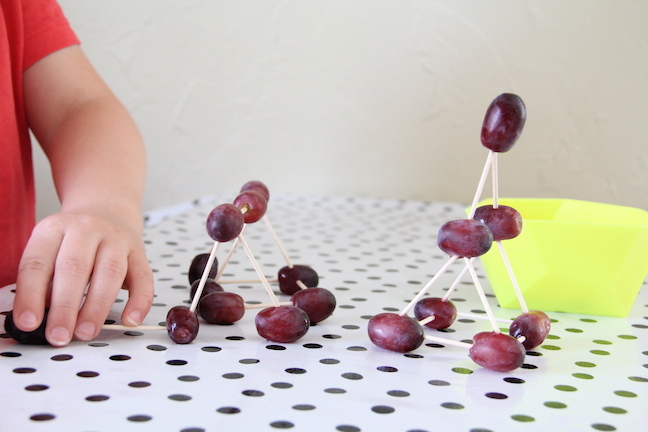 These snack time sculptures are one of my favorite ways to get him to sit quietly for 30-45 minutes to snack and play. It’s pretty incredible what he ends up building sometimes! 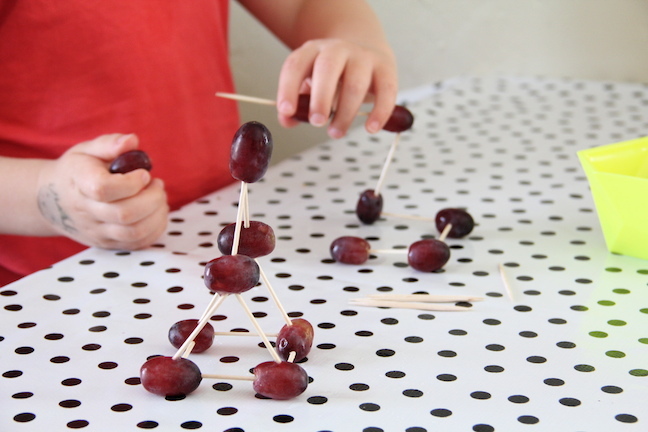 I’ve found that grapes are the easiest and least messy option for this activity, but you can use fruits like blueberries and cherries or veggies like grape or cherry tomatoes. 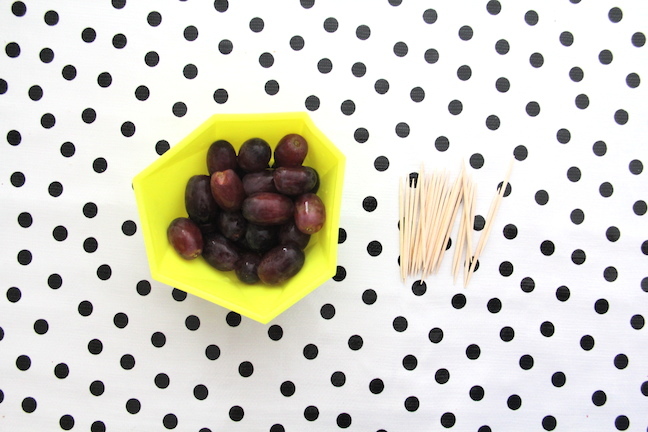 Avoid softer fruits (too slippery/messy), and harder fruits (too hard to pierce for little fingers). Anything small with a skin is best. 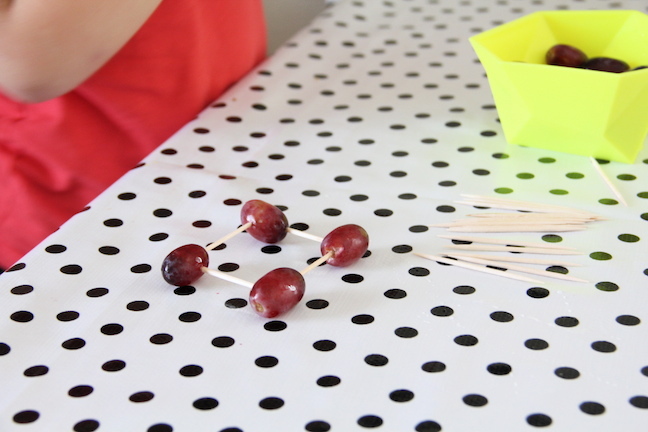 Step 1: As you might have guessed, you really just stick toothpicks into the grapes (or cheese, or cherry tomatoes) to build your sculpture. 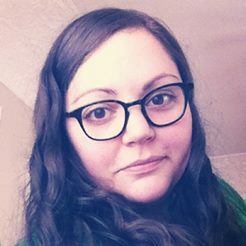 But! Start with a base. It helps your little ones to build up without getting frustrated when it falls over from the lack of a base. Step 2: Let the kids go wild! Let them build up and sideways to make whatever their heart desires. Step 3: Consume! 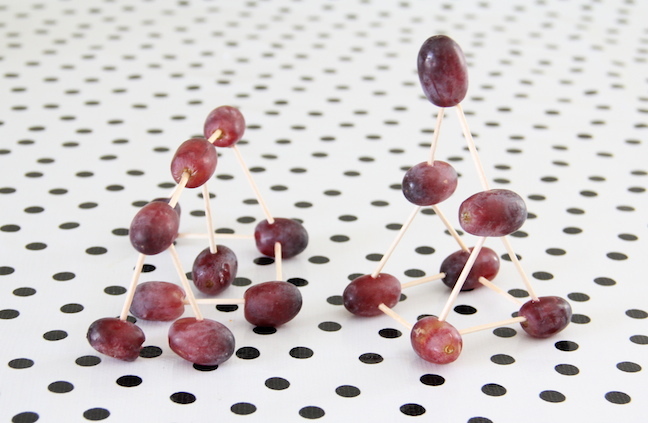 Grapes aren’t usually my son’s first choice for a snack, but I have to say, he scarfed them down after building these sculptures. Have fun and happy snacking!